One of the most annoying and universal symptoms of Cushing’s is sleepless nights. When I was in the beginning stages of Cushing’s, I would start waking up earlier than my alarm by an hour or so – I would usually get up at 5am, but now I was wide awake at 4am. Then 3:30am. Eventually, it was 1:30am and at some point, I would not be able to fall asleep at all until around 5am. Why does Cushing’s cause sleeplessness? Cortisol is a steroid produced by the adrenal glands and it is essential for life. It has a huge number of roles (there will be future blog posts on some of it’s other roles), but one of the roles it is best known for it’s role as a stress hormone. Your body instructs the adrenal glands to secrete cortisol when it perceives you are facing some sort of threat. If you ever thought you heard a suspicious noise in your house late at night and worried it was an intruder, that heightened sense of being alert and feeling ready to bolt at a second’s notice is partially due to cortisol. In a healthy person, cortisol has a diurnal rhythm, as illustrated by the red line in the graph below. Cortisol levels are very low overnight and start increasing right around the time you start waking up. Cortisol peaks in the morning around 8am and then gradually decreases over the rest of the day, reaching it’s lowest point when it is time for you to go to bed. And you thought it was just that pot of coffee you drink that was getting you up, showered, dressed and off to work in the mornings! The pituitary gland, partially through it’s regulation of cortisol, is helping to get you up and going during the day and letting you sleep at night. If you have Cushing’s, a tumor overrides your pituitary gland’s regulation of cortisol. Tumors don’t have a diurnal rhythm, as illustrated by the blue line in the graph. Tumors don’t care about what the pituitary gland is trying to do. They just spit out hormones whenever they want. 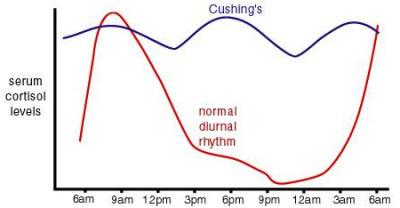 As a result, Cushing’s patients often lose their diurnal rhythm. Cortisol levels are high whenever the tumor decides they are going to be high. Cushing’s is like having an intruder knocking things over in your house all night long. The sleepless nights were really frustrating. I tried all sorts of over-the-counter sleep medications and eventually a prescription one to try and get my body to shut off and sleep. But nothing worked after awhile. At some point, I just gave up and tried to find other ways to entertain myself during these long, wired nights. Luckily for me, a friend of mine had twins not long after I stopped sleeping altogether on my bad nights. While I don’t wish sleepless nights on anyone (including new mothers), it was a nice time for her and I to interact. She and her husband were taking turns staying up for feedings and during her shift, we could chat over IM without waking anyone else up. We could IM for hours while she fed and changed the twins. It was a perfect way for each of us to have some company and talk about what was going on in her life and mine and I think for both of us it made those long nights a little more tolerable. Unbeknownst to me at this time, I had my own set of twins. My twins were delivered by a neurosurgeon about three months later. Although my twins will never take their first steps, learn to say “Mommy” or cost me a fortune in college tuition, I am happy to report I have not had a single sleepless night since their birth. Unfortunately, I cannot say the same for my friend. Nice humor in the ending wrap up. I was fortunate in not experiencing sleepless nights. My sense of humor got me through a lot of the bad times. It’s a great coping mechanism.